Click below to listen to our special Good Friday podcast. Also be sure to come back tomorrow and Sunday for special podcasts on Holy Saturday and Easter Sunday! Today we meditate on the crucifixion of Jesus. 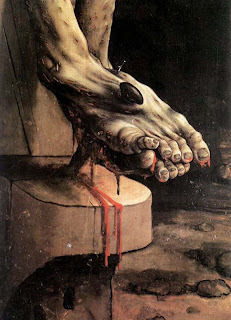 In places around the world, images of the Christ crucified will be contemplated and venerated. Indeed, the image of the cross is quite familiar to us. It is part and parcel of Christian iconography. Perhaps, it is too familiar. Put frankly, the cross has in many ways been sanitized. 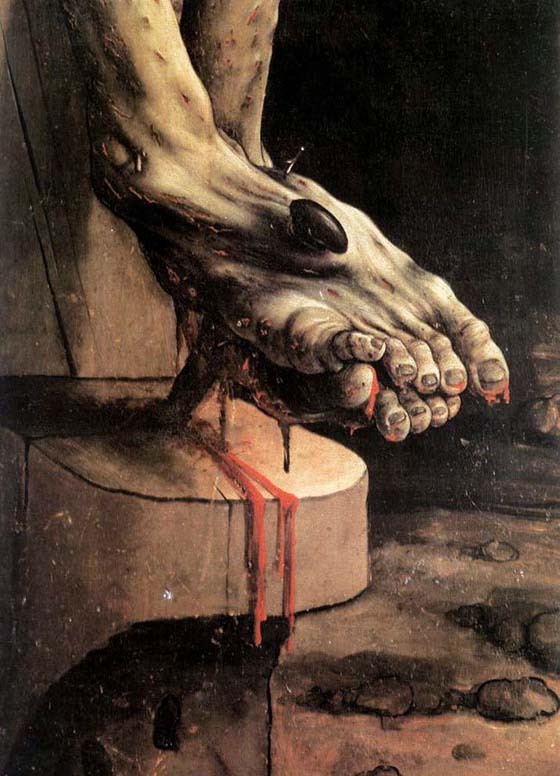 To some extent, Mel Gibson’s The Passion of the Christ (2004) helped bring attention to the actual violence associated with this form of ancient execution. Indeed, the attempt to re-dramatize the violence caused deep controversy. Some have even claimed that the film exaggerated the violence of Jesus’ death. For example, some complained that the scene of the scourging, a vicious punishment carried out prior to crucifixion, was unrealistic. Such complaints reveal just how “safe” Christian art has made Jesus’ suffering. As New Testament scholar Mark Goodacre explains, a quick look at ancient sources reveals Gibson actually showed some restraint. Describing the scourging of another first century man named Jesus—Jesus ben Ananias—Josephus, a first century Jewish historian, relates how his bones were “laid bare” (B.J. 6.304)(cf. Goodacre's piece defending the film here). The reality is, crucifixion was ghastly. Here I can only offer a brief treatment of the evidence. The fullest study is written by Martin Hengel.1 I’d also recommend Joe Zias’ fine overview here. In addition, be sure to check out Mark Goodacre's fine podcast on the topic. Seneca pointed to crucifixion to make the case for suicide. He made the case that no one would fault a person facing such a death for choosing to take their own life in order to avoid having to endure such a death. Can anyone be found who would prefer wasting away in pain dying limb by limb, or letting out his life drop by drop, rather than expiring once for all? Can any man be found willing to be fastened to the accursed tree, long sickly, already deformed, swelling with ugly weals on shoulders and chest, and drawing the breath of life amid long drawn-out agony? He would have many excuses for dying even before mounting the cross.” (Seneca, Epistle 101 to Lucilius). In short, crucifixion was ghastly. It was horrific. And it was supposed to be. Crucifixion was a way of terrorizing the population. It was meant as a deterrent. Oppose the might of Rome and this is what you’ve got coming. Moreover, mass crucifixions were not unheard of. In 71 BC, six thousand followers of Spartacus were crucified on the Appian as part of a Roman victory celebration al ong in 71 BCE – appear in the literature (Appian, Bella Civilia 1.120). After two-thousand survived the siege of Tyre, Alexander had them crucified next to the Mediterranean Sea (Curtius Rufus, Hist. Alex. 4.4.17). In particular, crucifixion was the punishment of the despised—runaway slaves and criminals. The cross was so closely associated with criminals, Plutarch writes, “each criminal condemned to death bears his cross on his back” (Plutarch, Mor. 554). Specifically, then, crucifixion was often used to punish rebels. It is no wonder that Jesus is linked with Barabbas--a revolutionary (cf. Mark 15:7). Indeed, Jesus' crucifixion coheres well with the Gospel accounts describing him as a "Messianic" figure. It is no coincidence Jesus was executed as "King of the Jews" by crucifixion. Such was the fate of those who appeared to challenge Caesar's political authority. 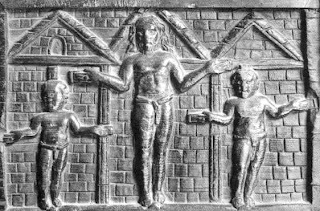 There is little hard archaeological evidence regarding ancient crucifixion. The most significant find dates back to the first century. 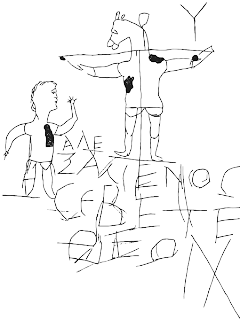 In 1968 archaeologists uncovered the bones of one “Yohanan Ben Ha’galgol” (or “Yohanan the son of Ha’galgol”), who apparently was the victim of crucifixion. He was somewhere between 24–28 years old when he died. His legs had been broken. Even more striking, there was still a nail in the heel bone. Since iron was expensive, it seems Romans would typically remove these from the body. However, this nail was curved on the end. Apparently, after going through the foot, it encountered some resistance (perhaps a knot in the wood). 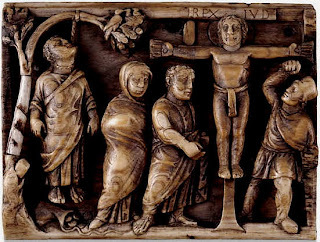 Based on the image scholars have come up with reconstructions of how Yohanan died.3 Though it should be pointed out that not all victims were hung from the cross in the same way. 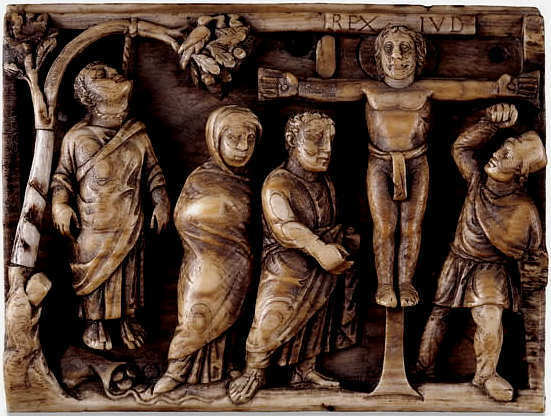 Josephus describes the way the Romans crucified figures in different positions (cf. B.J. 5.449–451). 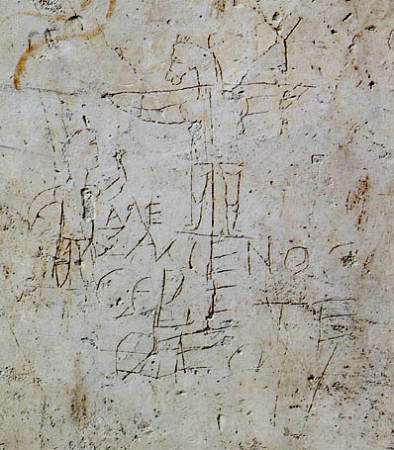 Of course, one last image of crucifixion could be mentioned. 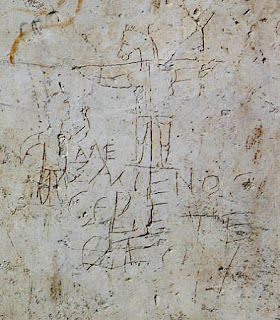 Below is some graffiti that depicts a man crucified with the head of a donkey. It includes the words, "Alexamenos worships [his] god." While nothing about it makes it explicitly anti-Christian, we do know that Christians were mocked with similar images according to Tertullian (Ad nationes 1:11, 14). Given all of this, it is no surprise that Christians were hesitant at first to even depict Christ crucified. 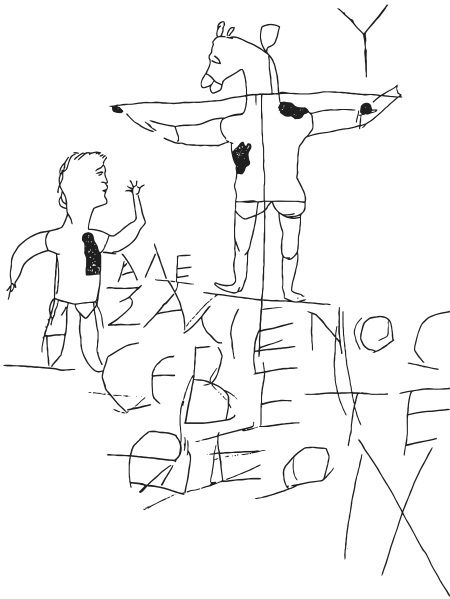 In fact, the two earliest surviving Christian depictions of Jesus' crucifixion are found relatively late. The first is located on the fifth century bronze door at Santa Sabina in Rome (the Roman headquarters of the Dominican order). 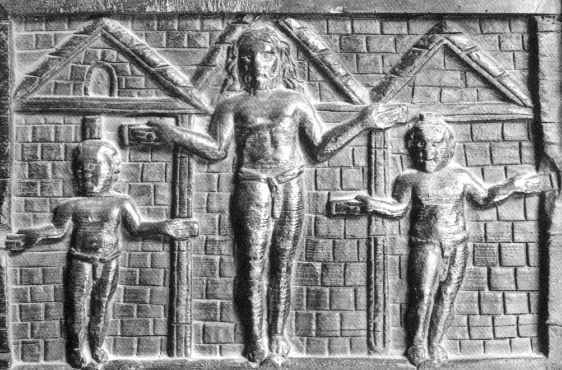 It depicts Christ crucified with the two other thieves. The other is the Maskell Ivories, a casket, also dating to the 5th century. Scene on the wooden door of Santa Sabina, Rome. 5th cent. In the Judaism of Jesus’ day, crucifixion was associated with curse. Deuteronomy 21:22–23 states that anyone executed by being “hung on a tree” is cursed. 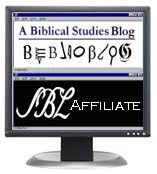 This was applied to crucifixion in the Dead Sea Scrolls (4QpNah 3–4.1.7–8; 11QTemple 64:6–13) and by Philo (Spec. Leg. 3.152; Post C. 61; Somn. 2.213). Not surprisingly, Paul had difficulty preaching the “Crucified One”: “we preach Christ crucified, a stumbling block to Jews and folly to Gentiles” (1 Cor 1:23). Why Did Jesus Die This Way? 1. Man knows thereby how much God loves him, and is thereby stirred to love Him in return, and herein lies the perfection of human salvation; hence the Apostle says (Romans 5:8): "God commendeth His charity towards us; for when as yet we were sinners . . . Christ died for us." 2. Because thereby He set us an example of obedience, humility, constancy, justice, and the other virtues displayed in the Passion, which are requisite for man's salvation. Hence it is written (1 Peter 2:21): "Christ also suffered for us, leaving you an example that you should follow in His steps." 3. Because Christ by His Passion not only delivered man from sin, but also merited justifying grace for him and the glory of bliss. 4. Because by this man is all the more bound to refrain from sin, according to 1 Corinthians 6:20: "You are bought with a great price: glorify and bear God in your body." 5. Because it redounded to man's greater dignity, that as man was overcome and deceived by the devil, so also it should be a man that should overthrow the devil; and as man deserved death, so a man by dying should vanquish death. Hence it is written (1 Corinthians 15:57): "Thanks be to God who hath given us the victory through our Lord Jesus Christ." It was accordingly more fitting that we should be delivered by Christ's Passion than simply by God's good-will. Thomas cites Augustine: "There was no other more suitable way of healing our misery" than by the Passion of Christ" (De Trin. xiii). You are of course talking about Ribi Yehoshua ben Yoseph in the 1st century, since J*sus is anachronistic to the 1st century.